Curt Siodmak is a horror writing legend. He is the genius behind Black Friday (1940), The Wolf Man (1941) and House of Frankenstein (1944) among others. 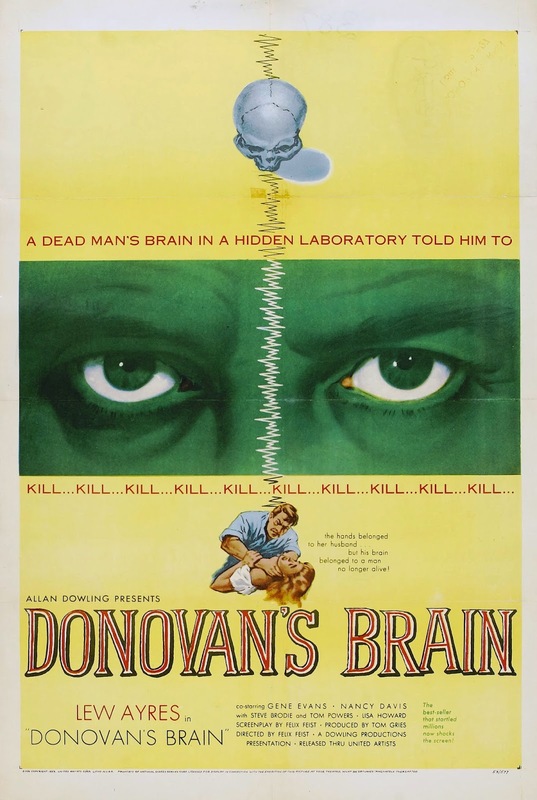 Siodmak also wrote the novel that inspired the screenplay for Donovan’s Brain. The basic set up is a classic Sci-fi horror story about a scientist who keeps the brain of a dead millionaire after he was killed in a plane accident. Where it goes from there is for you to enjoy! Needless to say, things take a sinister turn. While director Felix Feist is hardly a household name, he does a great job in the pacing of the film and builds suspense throughout Donovan’s Brain quite nicely. He also gets terrific performances out of his lead actors. Lew Ayres [Damien: Omen II and lots of TV credits] is perfect as Dr. Patrick Cory. He has a commanding presence on screen and delivers his lines with confidence and strength. I also enjoyed Nancy Reagan [Yes! President Ronald Reagan’s wife!] who plays Dr. Cory’s wife, Janice. What I especially like about the character is that this 1950’s woman is good for more than preparing dinner. She is an invaluable and competent research assistant and Reagan nails the part perfectly. Go, girl power! I had never seen Nancy Reagan in a film before and I’m impressed with her performance here. Enjoy this delightful piece of Sci-fi horror. It is most definitely worth your time.